Peaches are everywhere at the moment, gorgeous, sweet peaches and I couldn’t ignore them when I was planning the menu for last weekend’s Underground. 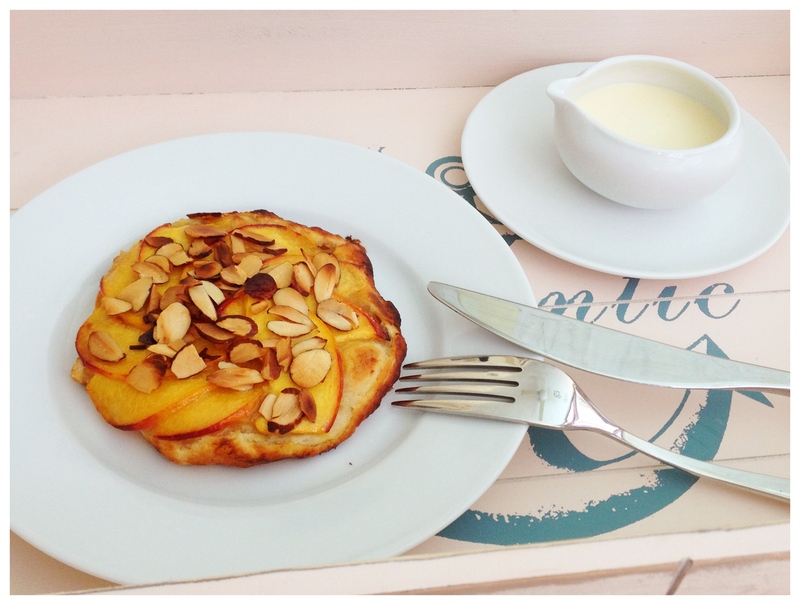 Saturday night’s five course dinner ended with this peach and almond tart and I’m sharing it because it’s a simple enough make-ahead dessert that looks quite impressive. And also because a recent guest to Shelley-belly’s Underground asked me to (and you know how I love requests). When I started playing with the peaches and trying to decide what to make I thought I’d try a play on an apple tart fine because I love the appearance of the fruit fanned out over the pastry.Then I thought I’d do a sort of Bakewell tart (usually made with cherries) because I wanted to incorporate almonds into the dessert. I knew I didn’t want to do a large tart that would require slicing, I wanted little, individual tarts that look pretty on the plate. So this, a combination of the two, was the result. It’s really easy, needs a bit of prep but doesn’t really require much more than patience. In an electric mixer (or with a wooden spoon if you the have the muscle for it) cream the butter and the sugar until light and fluffy. With the beaters running gradually add the egg and almond essence. Turn the mixer down to low speed and gently mix in the ground almonds and flour. This will keep in the fridge for a few days. A couple of peaches go a long way so tread lightly otherwise you just end up with a big bowl of peach puree sitting in your fridge and nothing to do with it but make Bellinis… okay, I just heard it. Make a lot, there’s nothing wrong with a peach Bellini made with fresh peach puree (couple of tablespoons of peach puree, top with chilled Prosecco, enjoy). If you have any peaches that feel like they may be a little too soft to slice neatly for the top, use those for the puree. Rinse a couple of peaches, remove the stones but don’t bother removing the skin, blitz the flesh in a blender until smooth. 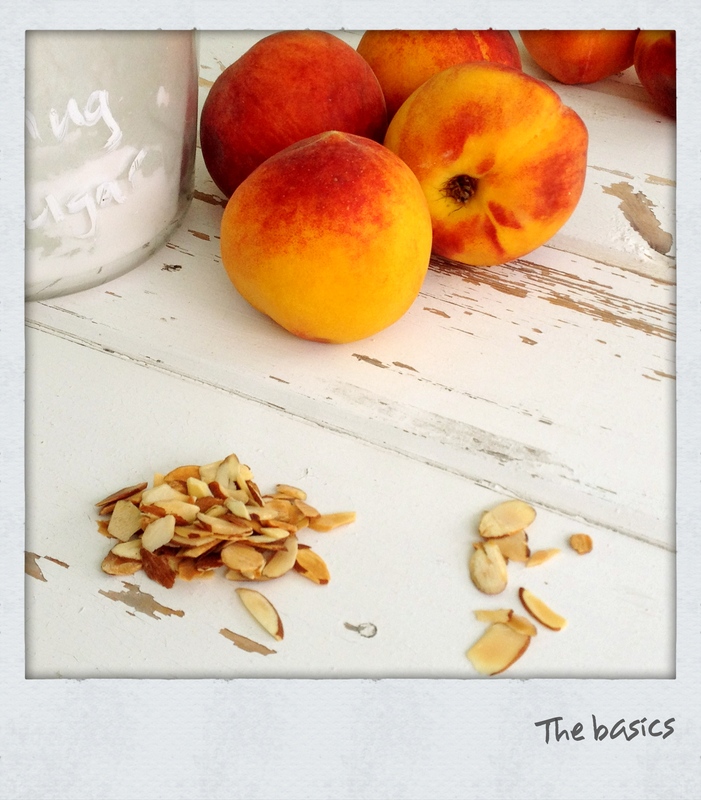 Taste for sweetness – my peaches were really sweet and didn’t need any additional sugar but all fruit is different. If your peaches are not as sweet or if you prefer the puree a bit sweeter add some caster sugar, a little at a time. Push the puree through a fine sieve to remove bits of skin. This will keep in the fridge for a couple of days but oxidizes quickly so cover with cling film (with the film pressed right down onto the surface of the puree) as soon as you’ve made it. If you have three days and the stomach for it, make your own (but you’ll have to find a recipe elsewhere), otherwise just use a good quality store-bought puff pastry. A 500g package of puff pastry will give you four or five eight to ten tarts (depending on how big you make them). 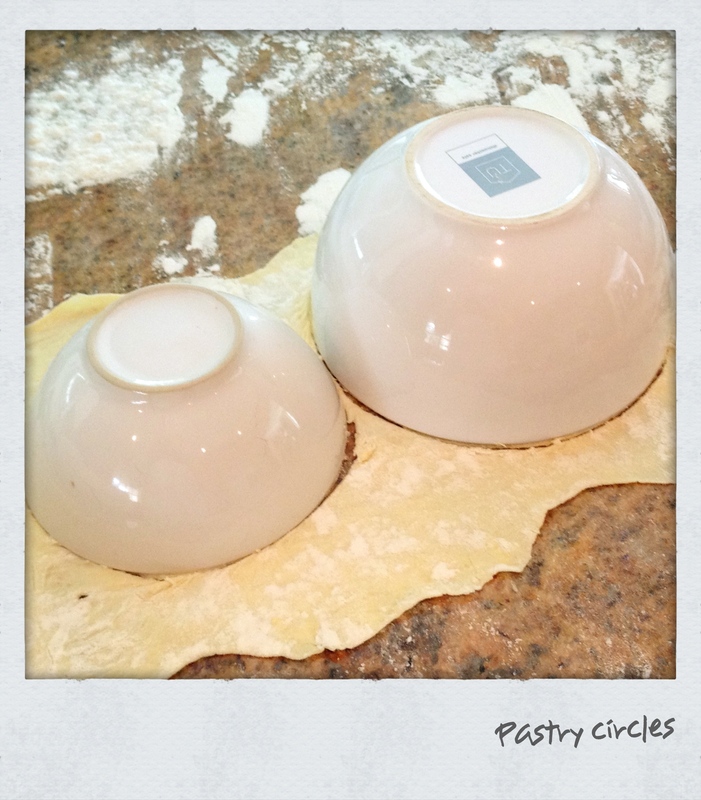 Roll out the pastry and cut the pastry circles**. They should be no more than a couple of millimeters thick and each tart will need two pastry circles, one slightly smaller than the other. The larger one should be about the size of a regular side plate. Again, a few peaches go a long way so don’t slice too many. 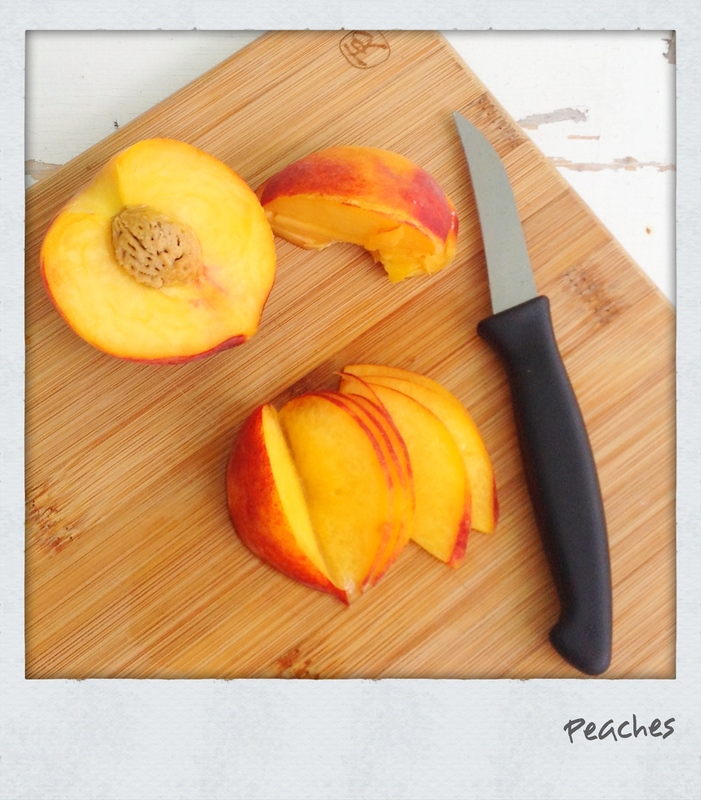 Thinly slice enough fresh peaches to fan out over the top of your tarts. Okay, once you’ve done all that you’re ready to start building your desserts. First, smear a good, thick layer of frangipane onto one of the smaller pastry circles – and I do mean a good, thick layer, don’t be stingy, it’s not attractive. 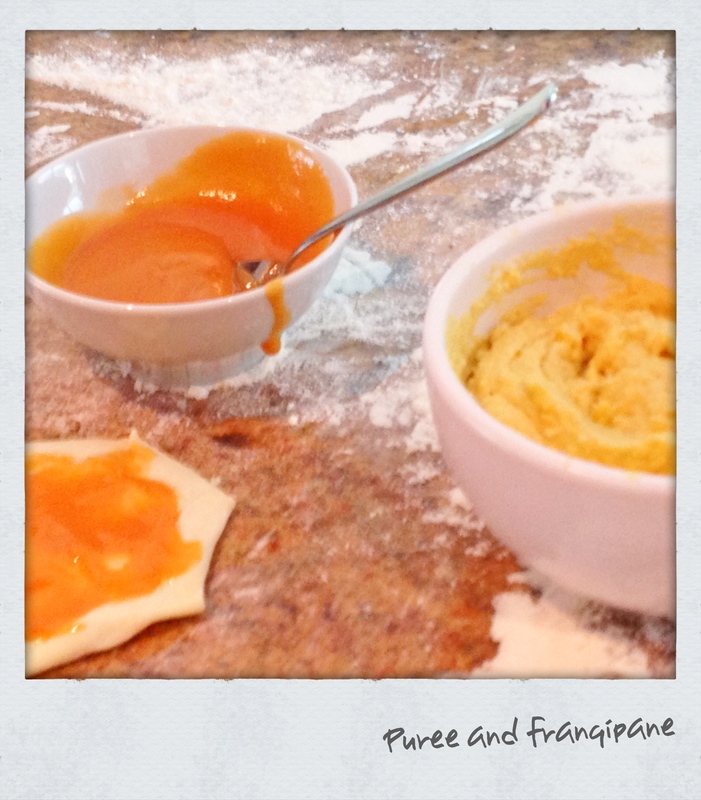 Then place the small circle, frangipane-side down, onto the centre of one of the larger pastry circles. Wet your finger with a bit of warm water and run it over the edge of the pastry circle to seal it then fold (crimp, pleat, whatever) the edges of the large pastry circle over the small circle. 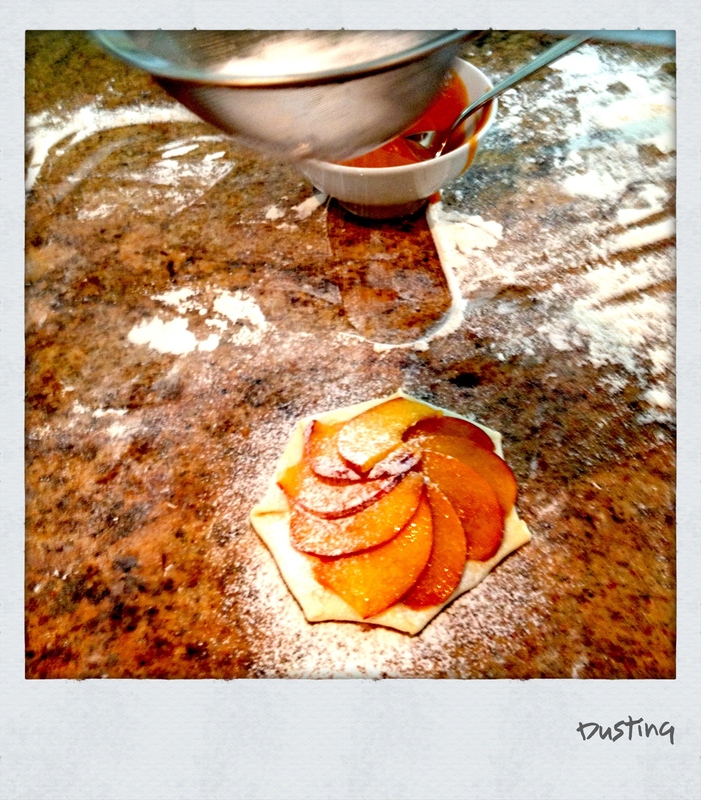 Next, gently smear about a table spoon of peach puree over the top of the pastry, avoiding the edges. 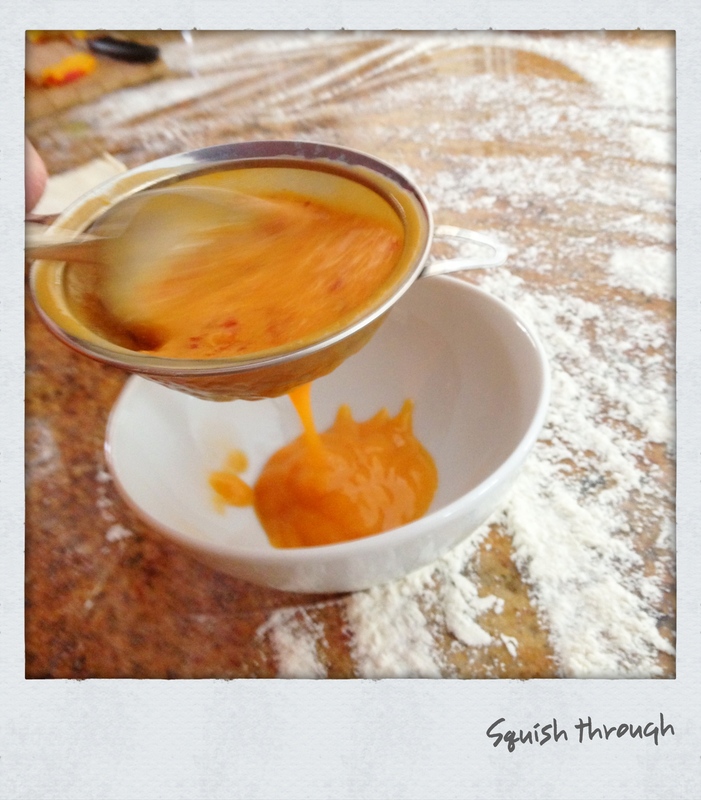 Fan the peach slices out over the top of the puree, don’t leave any gaps. Using a pastry brush, brush the whole thing with soft butter. These can be made a day before so stop here and refrigerate the pastries if you’re serving later. About 45 minutes before you’re ready to serve remove from the fridge to allow the pastries to warm to room temperature. Preheat the oven to 200 c/ 400 f, sprinkle the toasted almonds over the top of the pastries and bake for around 20 minutes. The peach puree gets insanely hot so make sure you let the pastries stand for a few minutes before serving. For Saturday’s dinner I served the tarts with a warm, almond scented homemade custard and the one in the photos is served with double cream – ice cold jersey cream, whipped cream, clotted cream, ice cream… just about anything creamy will work as an accompaniment. *The almonds will toast in the oven but I like to toast them a little before hand, I love the extra crunch it gives to the finished dish. ** After rolling out the pastry let it stand for a minute or two before cutting as it may shrink a little. I’d love your feedback if you decide to give this recipe a try. Enjoy. The date for the next dinner at Shelley-belly’s Underground will be confirmed later this week and details will be posted on the Underground page. In the meantime, if you’d like more information you can email shelleybellyunderground@yahoo.com. 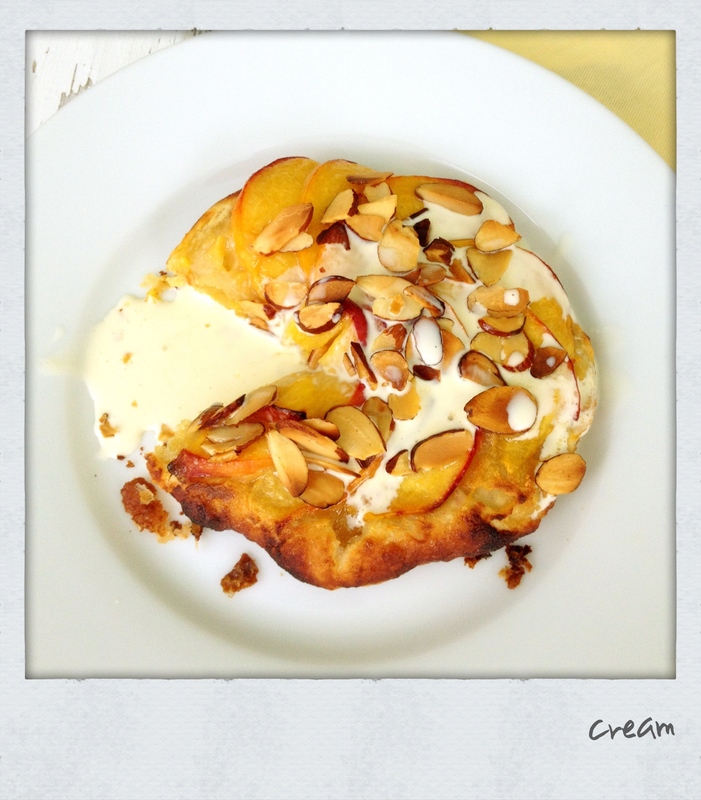 This entry was posted in Dessert, General and tagged Almonds, baking, dessert, food, pastry, peach puree, peaches, puff pastry, tart fine by Shelley-belly. Bookmark the permalink. I always have to wipe my keyboard after reading your blogg! Looks delicious and love the pic of the peaches and almonds on the table. All your pictures are so wonderful! What a lovely compliment Alesandra, thank you so much. Almond-scented custard! That sounds amazing. Also, this looks delicious, it made me jealous of your summertime. I think croissant-pastry might work well for the peach bases. We’ll have to try that some time. Well done on another shelley-belly underground dinner of deliciousness. Thanks so much. I think your croissant-pastry will definitely work and would probably be much more delicious than puff pastry. I can’t wait to come to one of your croissant classes – maybe March? Wow, how exciting, of course it’s okay – and you don’t have to call it “Shelly-Belly’s Underground Peaches” you can call it whatever you like. Thanks for reading. Got your msg, and thank you for following my shop,Your blog is rlaely fab. yes you can see some Indian digis in my shop because I am an Indian, and you give me a grt idea about muslim wedding and etc, although my stamp ” Indian Girl” is wearing a muslim dress.soon I will come with some muslim ritual digis, Yeah we too use salwar kameez a lot. Thanks again for your idea. Food Photography is a secret talent I never knew you had. Love your work. Not talent, luck! I take about 100 pics of each scene and I’m lucky if I can use one. Thank you though, I appreciate the compliment. It is also the composition of the picture the makes the photographs so fabulous – that’s the talent!